"The first rule when it comes to making Paella is that you're not allowed to cook it unless you can pronounce it properly, it Pah-ey-uh"
I have done a lot of reading this week. Seems I fell down the rabbit hole of the dish known as Paella and what I have learnt from all this study is there is one sure fire way to piss off a Spaniard and that is by messing with their Paella. Just ask Jamie Oliver who received a truck load of vitriol when we posted a "Paella" recipe on his website. His sin, the true crime he committed against all of Spain and most of all the people of the region of Valencia...he stirred the Paella. Oh and there was Chorizo in it. Two crimes apparently worthy of a lynching. This then lead to much research on my behalf and some heated discussion in our household. We veered from cultural appropriation, the hot catch phrase these days to authenticity to creative licence and where did that all lead....nowhere really. All I know is that if you don't want to piss off the Spanish then don't cook any old rice dish with any old ingredients and call it a Paella. 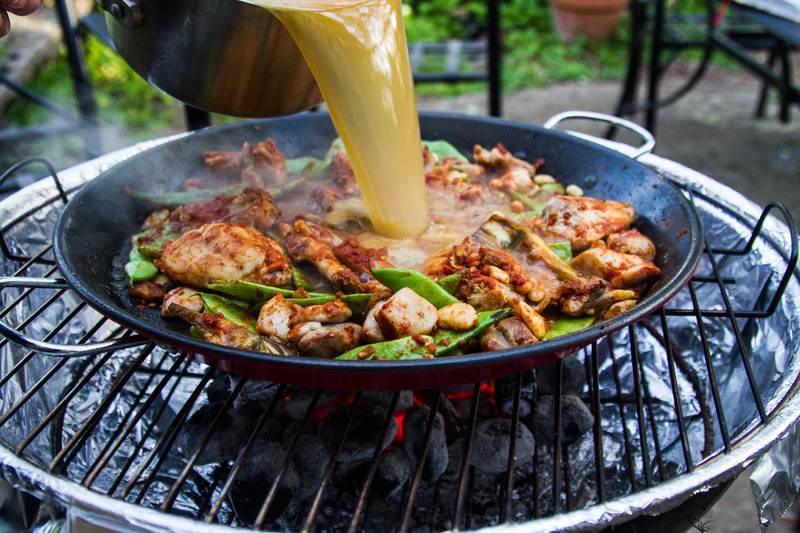 With such passionate beliefs on what is a true Paella and I knew I had to explore it more. It turns out the rice dish we all know and call Paella, you know the one smothered in a wide array of seafood isn't actually Paella at all. Spaniards would prefer this dish to be called an Arroz dish, the Spanish word for rice. The true Paella has very specific ingredients. There are three main proteins chicken, rabbit and snails. These are accompanied by beans both green and white as well as seasonings of Paprika, Saffron and Rosemary. 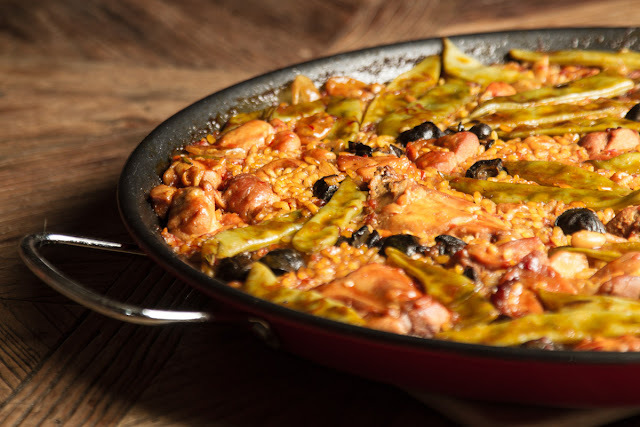 When in season Artichokes can also be found in the Paella. It is all cooked up in the famously wide Paella pan, originally over coals but today more so over a gas flame. 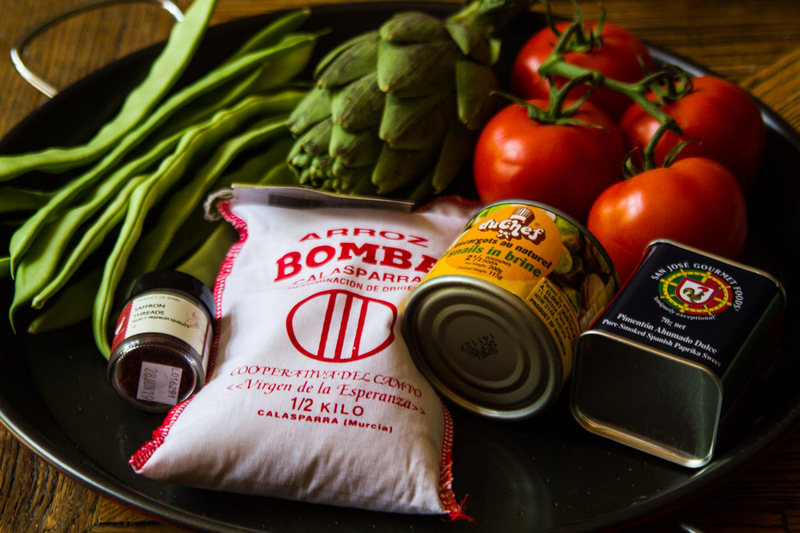 Bomba rice is recommended for best absorption without breaking down and a chicken stock is the liquid medium. Seeing as the spirit of this blog is learning and cooking cuisines from around the world I didn't want to walk the fine line that is debated over Paella. 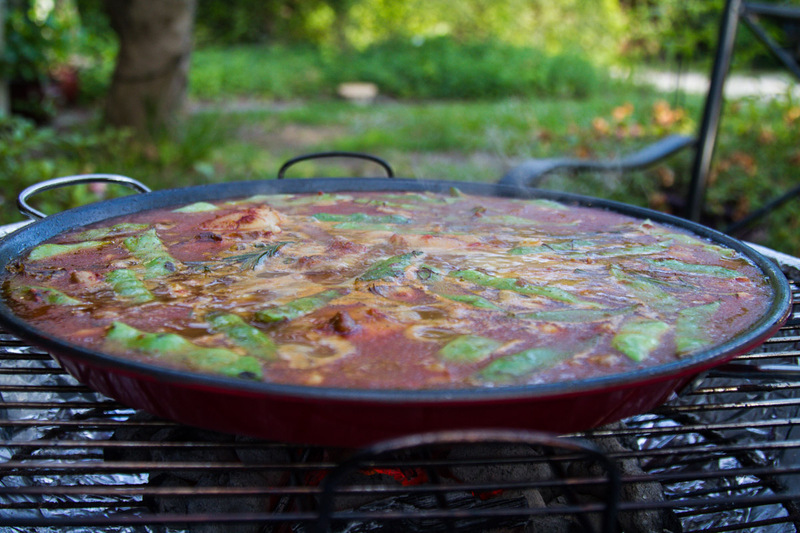 Instead I have decided to bring you a recipe for the original, the Paella Valenciana. I have cooked this one over coals as cooking outside is a fun change from the kitchen now that it is warming up but this dish goes just as well on your gas burner. You are actually aiming for a slightly burnt and crusty bottom. 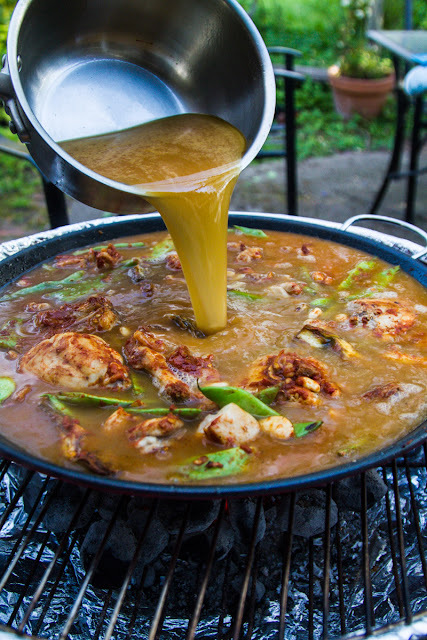 The Spanish call this the Soccarrada and if you achieve this you can consider yourself a Paella master. 2 Artichokes trimmed to hearts and quartered. Add the olive oil to the pan and heat over high flame. Add the chicken and cook till browned all over, you want some nice caramelisation. 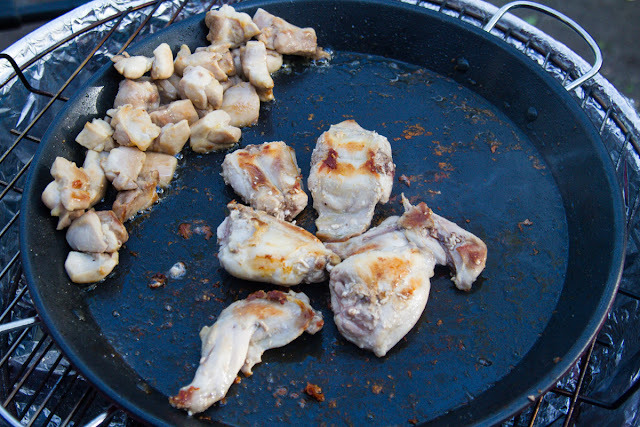 Push the chicken to one side of the pan and add the rabbit. Again cook till browned all over. 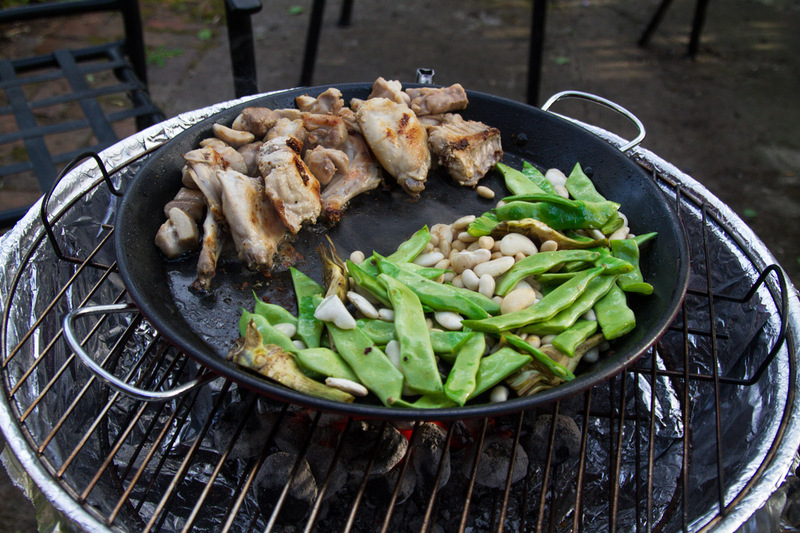 Push the rabbit over with the chicken and add the green beans, white beans and artichokes. Cook for around 5 minutes. 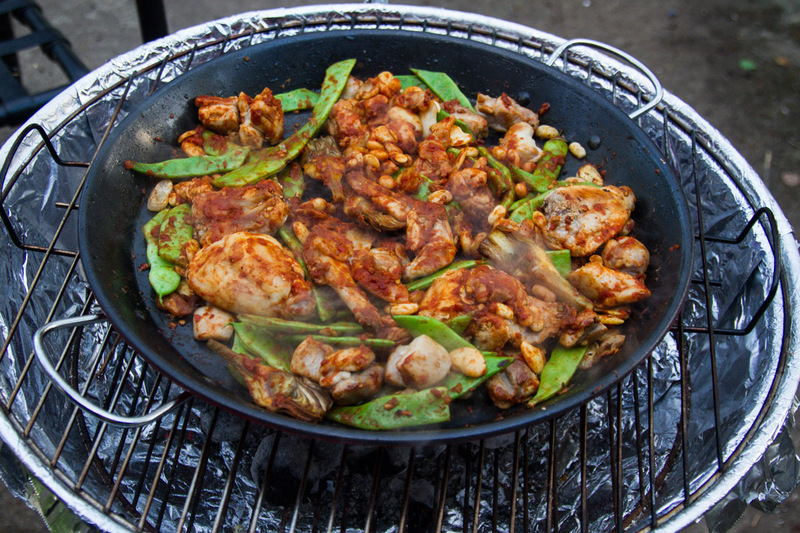 Push beans and artichokes to the side of the pan with the meats and add the tomato pulp. Cook tomato for 5 minutes then add the paprika cooking then together for 1 minute. Stir all of the ingredients in the pan to combine and cover the base of the dish. Pour in the chicken stock and soaked saffron. This should come close to the top of the pan. Simmer for 30 minutes, topping up the liquid if it goes below the handles of the pan. Add the snails stirring to distribute them evenly. Add the rice to the dish but pouring in a swirling motion to evenly distribute through the liquid. You can give it a quick stir to even it out of required. Cook for 20 minutes or until the rice is done and don't stir at all! The liquid should be at a steady simmer over a medium heat. The rice should be al dente when the heat is turned off. Rest for a further 15 minutes before serving. 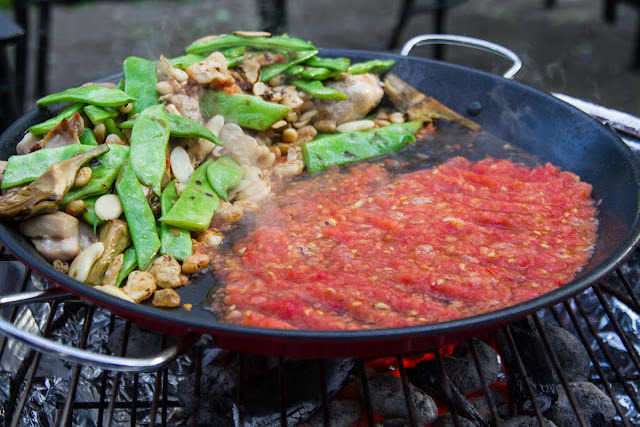 Serve by scooping out Paella whilst scraping the base to ensure the crunchy bits on the base of the pan are included in the serve. Here are my step by step pictures to give you some further detail on the cooking process. Looks like fun. I must show you the cookbook that Patrick and I bought in Spain in 1974. Definitely Liz. I would love to see it.